When you’re new to bullet journals, it’s a bit scary, right? You don’t want to make a ton of mistakes and you want to enjoy it. 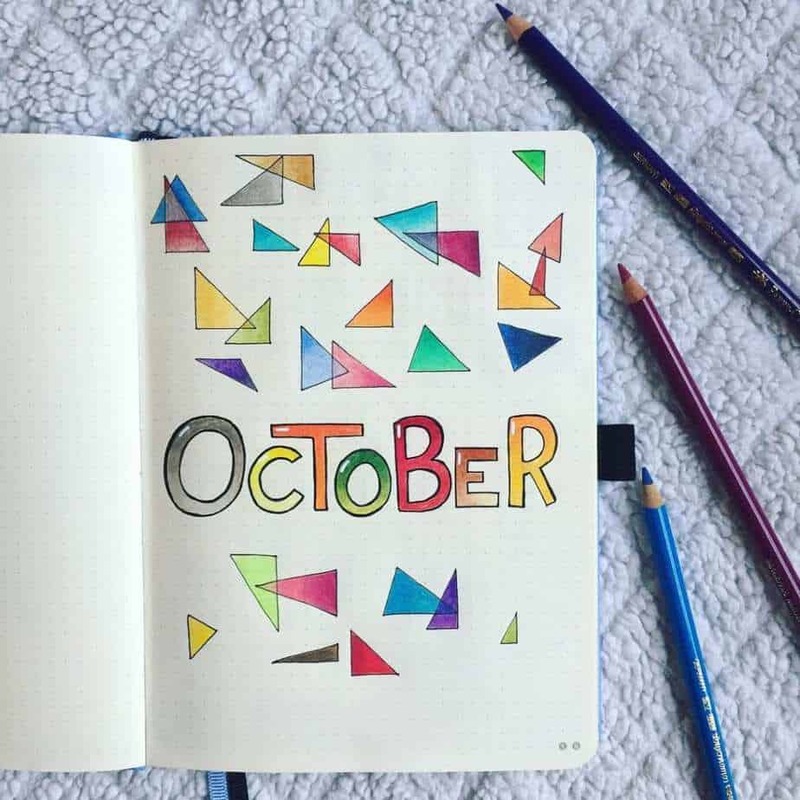 I remember my first month, even my first week, of using a bullet journal. Back then, I wish there was more out there on everything you need to consider when starting a bullet journal. Now, I’m far from that moment back from October 2016. It’s amazing how much you learn using a bullet journal for two solid years. And now I want to share the pro bullet journal tips I’ve learned! Like, seriously, the lessons I’ve learned compared to what I learned in my first six months are very different and I’ve grown a lot as a bullet journal artist. So, while the lessons from my first six months are very relevant, I decided to kick it up a notch and talk about some of the other lessons from the other 18 months of bullet journaling! 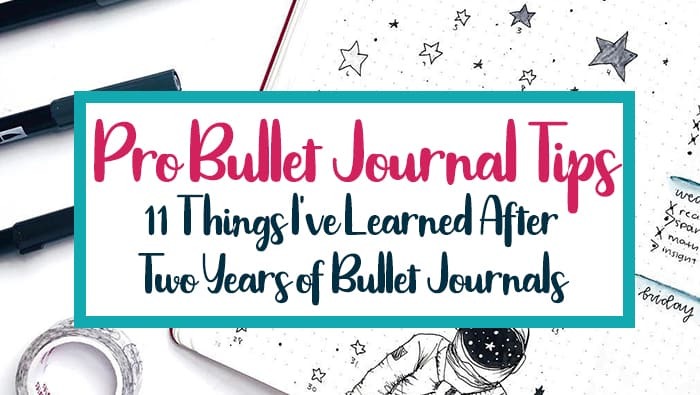 Here are 11 incredible bullet journal tips I’ve picked up from the first two years. Bullet journal supplies are a fickle thing. Reading reviews can be helpful to some degree, but a lot of times it seems like the reviews ultimately reflect personal preferences. Yes, there are definitely some things that everybody hates- like bleeding. But for the medium, whether it be notebook, pen, markers, pencils, stickers, stencils, or what- you’re going to find people who absolutely LOVE a specific product… and you’re going to find people who absolutely HATE a specific product. Even if the majority find said product absolutely AMAZING. So, treat reviews with ease. Obviously, if you see continued, major issues with a product- then you probably shouldn’t buy said product. And what happens if you purchase something you don’t like? 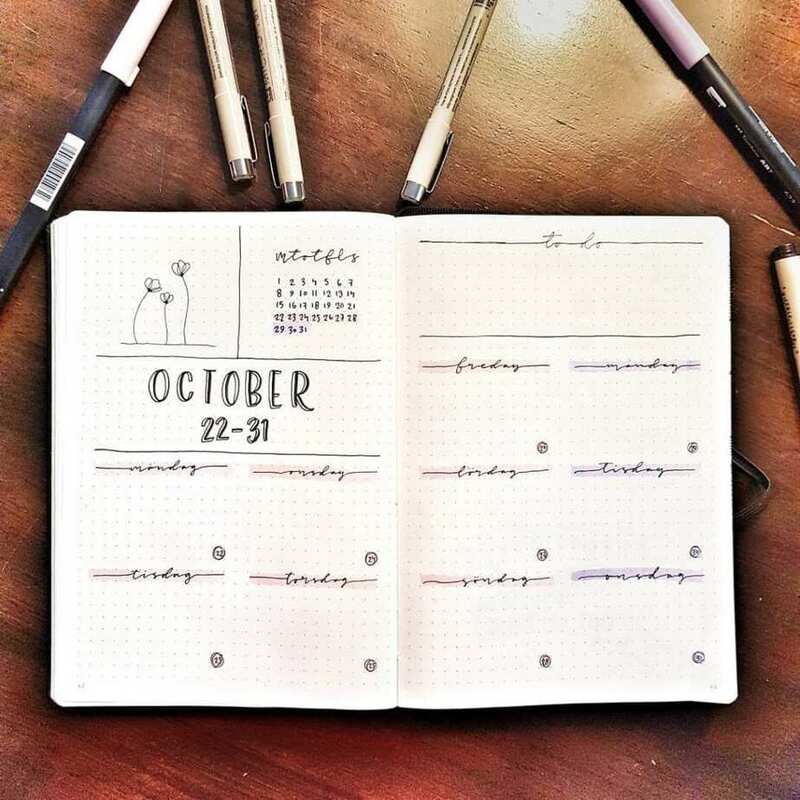 Get on some planner and bullet journal sale pages (they are all over Facebook!). If you can’t return the items you purchase, chances are you can sell them to somebody else for a slightly lower price. That said, even though you’ll find people who love and hate every single bullet journal product out there, there is SO much truth to buying high-quality products. While there are some amazing products that are inexpensive and well-loved, such as the Crayola Super Tip Markers, there is one thing I’ve noticed about products that are low cost and low quality. They will almost ALWAYS cause bleeding in your notebook. Cheap, low-quality markers will bleed on the pages of even the very best notebooks. Cheap, low-quality notebooks can’t take much ink of any type before they bleed. Now, if that doesn’t bother you, then I wouldn’t worry about this point. I’m also not saying that all low-cost products are bad (again, hello Crayola markers!). But typically, you’ll find bleeding and issues like that happen less frequently with high-quality products. If you can’t afford them, or your young kids may ruin them (I have a five-year-old, I know how it goes! ), ultimately get what works for you! Try not to be shocked. But this is one of those bullet journal tips I have to share because I don’t always use what I make. I’ve noticed that there are some months where I use my bullet journal religiously. Trackers are filled out. I actually fill out all of the weekly spreads. There are also a lot of months where I literally create my bullet journal spreads for the month… and that’s it. I don’t touch it the ENTIRE month. 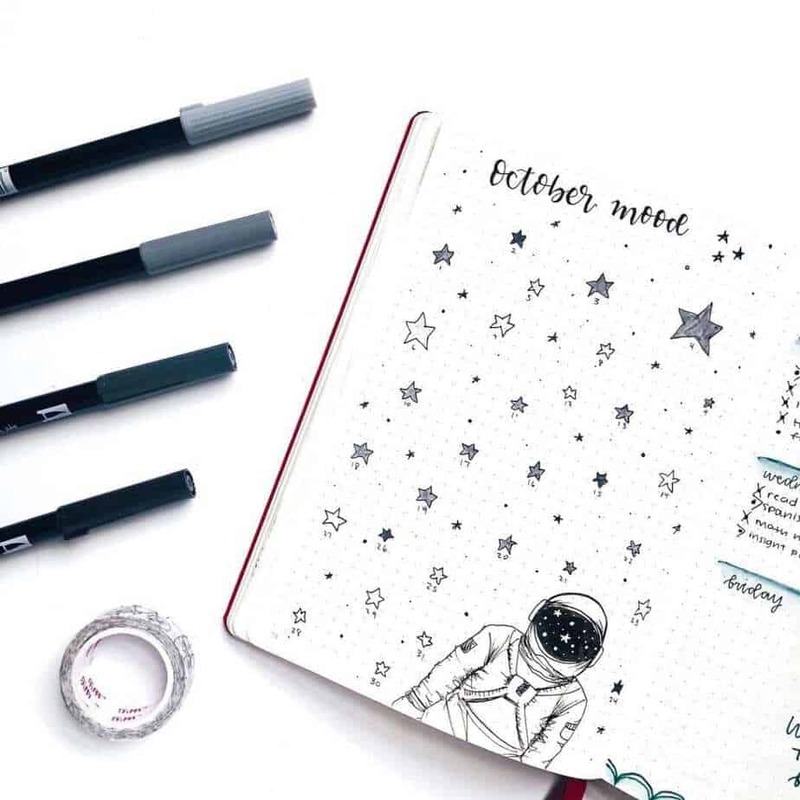 Now, you probably think that the potential of creating an entire, intricate bullet journal monthly setup and not using it sounds bananas. And maybe it is! But I honestly find ‘creation’ to be a very relaxing event. Even if I spend 4-6 hours creating beautiful pages and I don’t use them, I can say I really enjoyed those hours in the creation process. So, your mileage may vary. If you have a couple of off weeks or months and you don’t use what you created, don’t sweat it! Two years in, and you’d think that everything that I come up with for my bullet journal is solid. Right? Even in my second year, there are just some things that I try to create that don’t pan out quite in the way that I hope. Exhibit A: My bullet journal narwhal theme for November 2018. I had a lot of high hopes for this theme. I freaking love narwhals. But I had a hard time finding inspiration, and then I found doodles all looked pretty similar. While it was a fun theme, frankly, it bombed. When I started, something like this would have probably set me back or caused a bit of anxiety. But now I can just laugh at scenarios such as this and move on. It’s probably one of the most valuable lessons you can take on when having a bullet journal. The previous point was more about things not turning out the way you expect. This one is more focused on blatant mistakes. And I hope this is one of those bullet journal tips that will give you a sigh of relief. In the first six months of my bullet journal life, if I made mistakes, I’d probably do whatever I could to make them go away. But it wasn’t always that way. In fact, somewhere into your first year though, you actually get more comfortable with letting them slide. Instead of fixing them, you actually just laugh at them. And then you choose to keep them because it always makes you laugh. When I first started bullet journaling… and for like, the first full year… I believed that all these stellar artists were free-handing their bullet journal spreads. When I started seeing videos surface on Instagram of these incredible artists actually setting up their spreads in pencil first, I was in for a huge shock. Related: Is It a Waste of Time To Create Rough Drafts in your Bullet Journal? And best of all, you can do that without wasting paper. If you don’t like something, you can just erase it away! Definitely one of the most valuable bullet journal tips I could share with you! Ok, maybe ‘cheating’ is a strong word. But hear me out, ok? And then I find out later that what I’m seeing is a result of stickers, stamps, and stencils. What’s funny is, this is one of the bullet journal tips that took me a solid year and a half to figure out. When I realized this, I was almost a little bitter! I would think ‘Well, I’m certain my bullet journal spreads would look that amazing as well if I took advantage of those tools more frequently!” Like- how did I not realize this sooner?!? For those of us who don’t have that much of an eye for art, looks can be extraordinarily deceiving. Yet it is much like my point about people who sketch in pencil first. We shouldn’t berate ourselves for what we can’t do. Instead, we should focus on what we can do with our bullet journals. 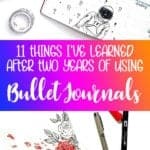 So if stickers, stamps, printables, and stencils help you to become a better bullet journal artist while helping you put less pressure on yourself, then cheat away! I don’t consider doodling hacks to be a ‘cheat’, because in this case, you are creating your doodles yourself. I’ll be honest, I don’t have an artistic eye. I can’t look at something and replicate it. Those who do have an artistic eye have the ability to see something that is literally so simple, you cannot draw proper art without it. What is it? Artists can see basic shapes: rectangles, circles, squares, and triangles. It doesn’t sound particularly profound, but they are the foundation of any good art piece. While I’m not recommending trying to use shapes to go create the next masterpiece, look for step-by-step doodles that break down doodles into simple shapes and lines. Approaching your art with this in mind can help prevent careless mistakes. It can also help simplify art tremendously. 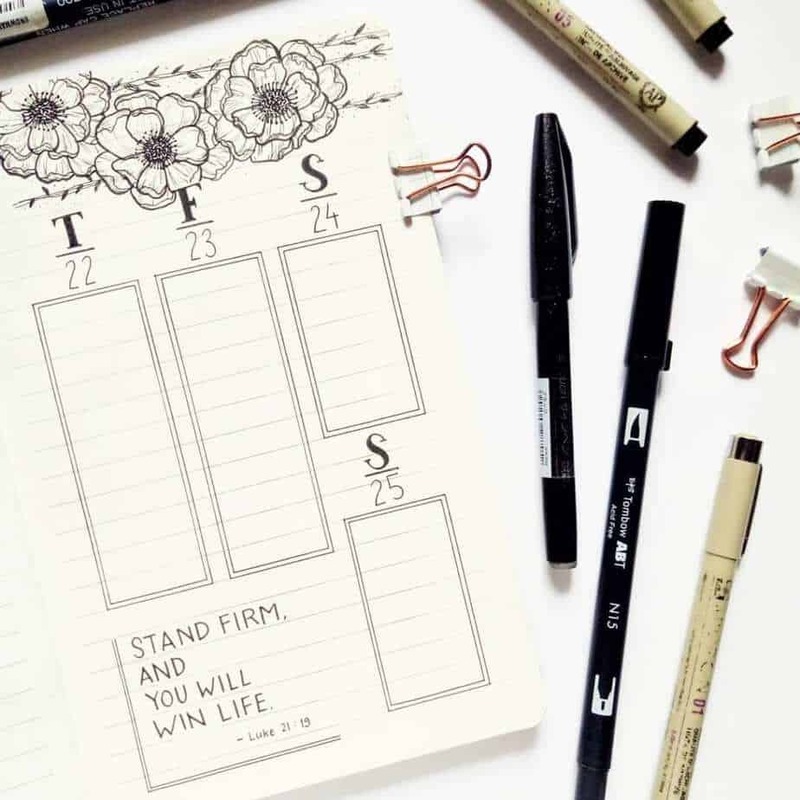 A lot of the points above are all about optimization, and there are even more ways you can optimize your bullet journal so that it works for you instead of the other way around. And those are just a small handful of examples of optimizations that save time and energy. 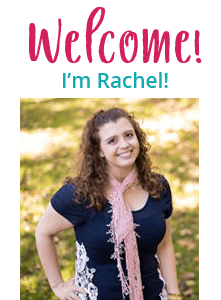 I don’t normally try to go on a soapbox on the blog. But if you’re a good artist, chances are you may run into this down the road. Now, personally, I love it when people create spreads that are inspired by spreads I’ve created in the past. Even if it’s a copy! There’s not much original in this world, and I don’t create explicitly complicated layouts in the first place. I do have a problem with people who post my stuff in places where they could monetize my work without providing credit. I also have a problem with people actually stealing my art directly and having it link to their Instagram pages, blog posts, or wherever else they are trying to take credit for my work. When it comes to the nitty-gritty legalese of this point, I’m not your lady. But there is a terrific blog post all about creativity and copyright I highly recommend. It goes into more detail about what is appropriate, and what is not appropriate- and it’s all written in the context of bullet journal work. So make sure to save this page if you ever have any questions or concerns about people using your work. It’s one of those bullet journal tips you should always have in the back of your mind, especially if your account goes viral! I waffled for a while debating on sharing this as one of my bullet journal tips, but since it’s something I’ve seen more frequently, I figure it’s something I need to bring up. 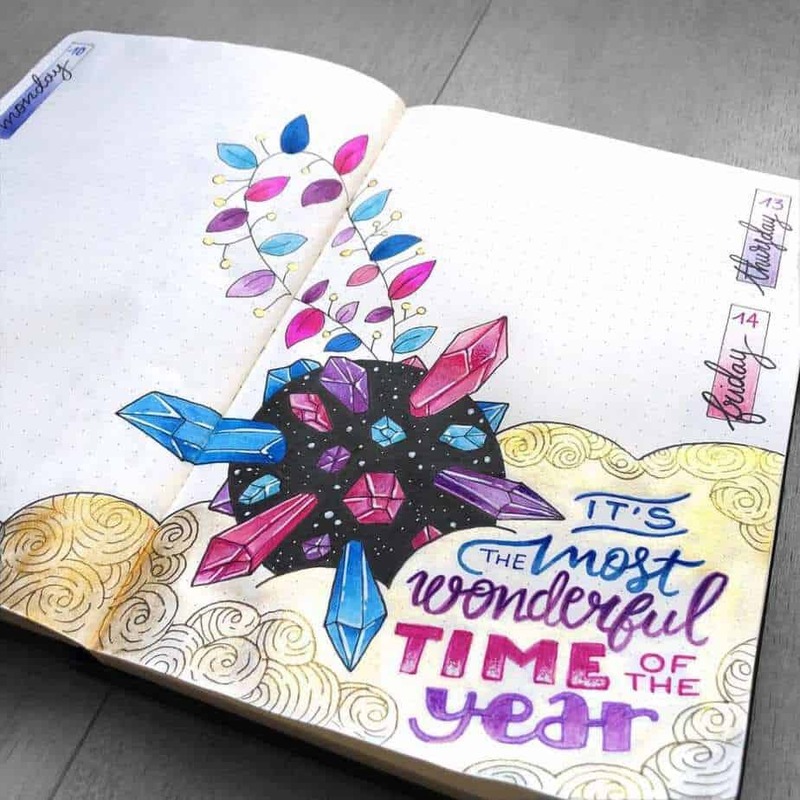 I freaking love the bullet journal communities on Facebook. Great ideas, the ability to meet up with amazing, like-minded people, and tons of bullet journal inspiration galore. That said, you may find a lot of drama. If you’re like me, you’ll probably stay out of the drama. If you do something wrong and get called out, own your mistakes and FIX IT. 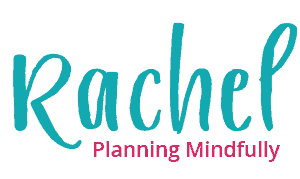 Do not half fix it, or ignore it, because the planner community is fierce and they do not forgive blatant stupidity. And if it’s somebody else’s drama, and you’re bored, you can always go make some popcorn and watch the show, Michael Jackson style! Long story short, be smart and credit other people’s work. If the drama really bugs you, you can always leave the group. But I’d really recommend just not letting it get to you because you’re going to find drama in any Facebook group. Trust me- I did babywearing for two years. Yes. Wearing your kid. The drama was even WORSE. I cannot tell you how much I’ve enjoyed my last 24 months of bullet journals- it’s been such an incredible journey of growth. I’m more organized and have a better handle on my life. Not to mention, it’s brought me this blog, a book (soon to be published! ), and amazing relationships with terrific bullet journal artists. 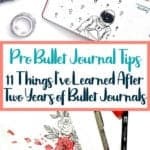 I hope that these bullet journal tips I’ve learned over the last two years help you to be a better bullet journal artist! 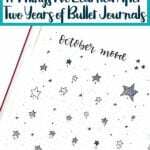 How long have you had a bullet journal? What lessons have you learned since you started? 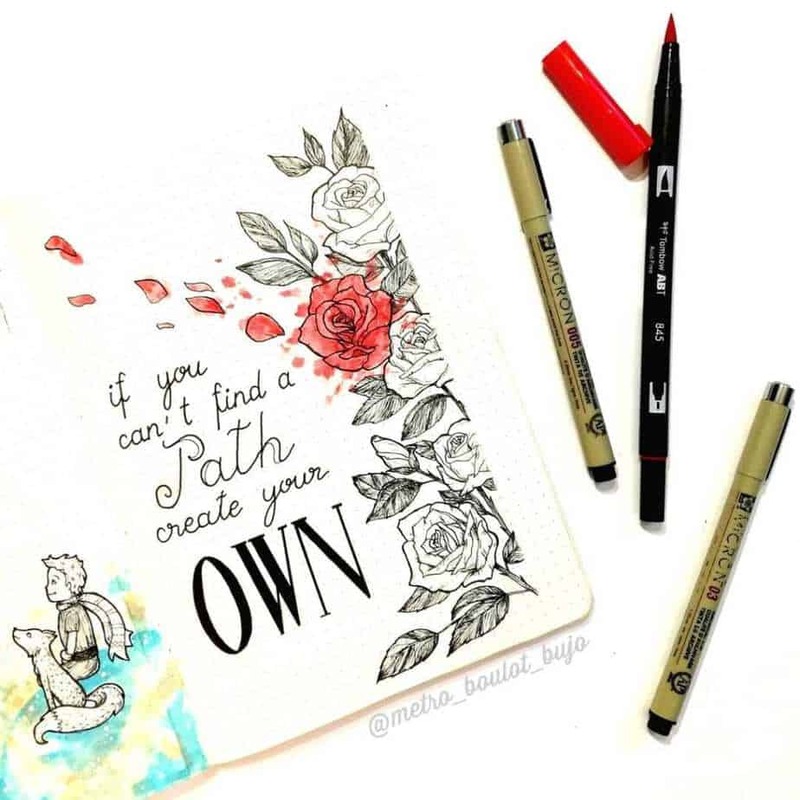 If you haven’t started your bullet journal yet, what is holding you back? I’d love to help you out, so please reply in the comments! 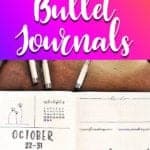 Ready to start your first bullet journal? Read the Ultimate How to Bullet Journal Guide to get started! 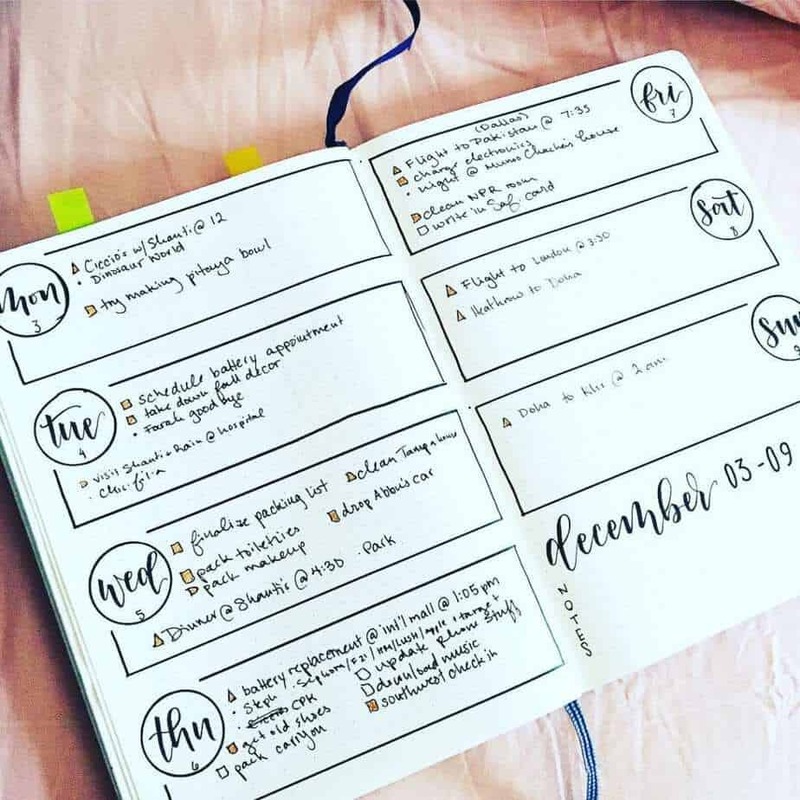 Did these tips help with your bullet journal? Make sure to share this on Pinterest! Thank you for this post! I found it helpful, releasing, refreshing and inspiring! thank you for your post. I have been contemplating a bullet journal for a while now and have just felt overwhelmed at where to begin, (worried about mistakes and such) after reading this I now have the gumption to just do it!